The chairman of the Totternhoe Allotments Association is appealing for the public’s help after four sheds were set on fire on Monday. This is the third time in three years that sheds at Totternhoe Allotments, in Church End, have been targeted by arsonists. The sheds were set on fire between 12am and 1am on Monday morning. Pauline Ellis, chairman of the Totternhoe Allotments Association, said: “Someone came into the village and set fire to four of the sheds at the allotment. The sheds were very close to the chickens, fortunately none of them were hurt, and nobody was hurt but the sheds are completely burnt down and everything inside them is gone, all burnt to the ground. “This is the third time in three years, we are fed up, it is not fair on the people that use the sheds, one of the sheds belonged to a young family, who had their shed attacked in 2017, again they lost some of their daughter’s toys as well as their tools. It’s very frustrating. 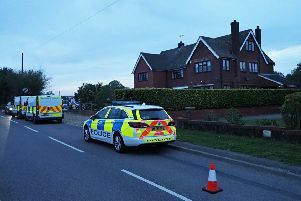 Police are also investigating a report of a garage on fire, situated in a block to the rear of Park Avenue in Totternhoe at around the same time.